It’s been another weekend of Kleenex, Netflix, and soup—i.e., another lousy cold. I say “another” because colds have been pretty constant this year so far, though this one was definitely the worst I’ve had (bad enough that I got a rapid strep test; the doctor at urgent care also saw me with the sprained wrist a few weeks ago, and we had a laugh about how this isn’t my body’s month). When I wrote about being run down in April, I mentioned the importance of respecting my body wherever it is—whether I’m exhausted or energized, sick or well. I also wrote about how feeing ill, especially for prolonged periods of time, can sometimes summon up my orthorexic tendencies, challenging the part of me that still struggles with my body not being as I’d like it to be. The last two days have definitely brought all of this up. I’d been feeling better since graduation and hoping that leaving behind the past semester and all of its associated stagnancy and burnout would bring me back to “normal.” I put quotes around this word because I understand intellectually that bodies are always changing with time, and our baseline senses of normalcy are bound to evolve. But the truth is that I’m still clinging to an old vision of what health looks like for me. I don’t mean that I’m ready to accept constant sniffles and feeling run down as the way things need to be or will always be—in other words, I don’t perceive the way I’ve been feeling lately as my new norm. It’s communicating weariness, and there’s a spiritual dimension to all of this, too, a soul sickness that I’m working through and have been for some time. But it’s time to accept that what it takes to keep me healthy—as I understand and experience health—has changed dramatically in the last decade. I have to be a lot more careful than I used to be about how I take care of myself. I have to heed my body’s cues sooner and more sensitively than I did in the past, because ignoring even small signals tends to place me in the hands of some bug or another. I need more sleep than I used to. I’ve had to completely redefine what a reasonable day’s workload looks like. And while I’ve always enjoyed being mindful of nutrition because nutrition and food fascinate me, I need solid nutrition now because my well-being depends on it. I’ve known this for a while; when I was leaving DC, having dealt with several major viral and bacterial infections in only a couple years—not to mention chronic lack of sleep—I could already sense that I’d been physically changed by my post-bacc experience. How true that premonition was, but a part of me still wants to ignore it. Long after I gave up my anorexic attachment to lightness and smallness, I retained an attachment to being lively and quick, which I fueled by pushing my limits and ignoring the warning signs of fatigue. Just as I’ve learned to maintain and nurture an identity that isn’t confined by the underweight body I used to feel at home in, I’m now learning to inhabit a body that demands more of my attention and care. Once again, I’m being asked to be comfortable with the idea of physical necessity and hunger—not for food, but for whole body nourishment. I hope that over time I won’t perceive this as inhabitation so much as true embodiment—really being in and of my body. Right now, there’s still some curiosity, confusion, and feelings of distance as I befriend a physical self that is slower and much more sensitive than the one I’m used to. That’s OK. Friendships can be built gradually. On that note, it’s time for soothing food, rest, some fun TV, and another pint or so of tea. And some beautiful recipes to gaze at, because I experience all things culinary as medicine! 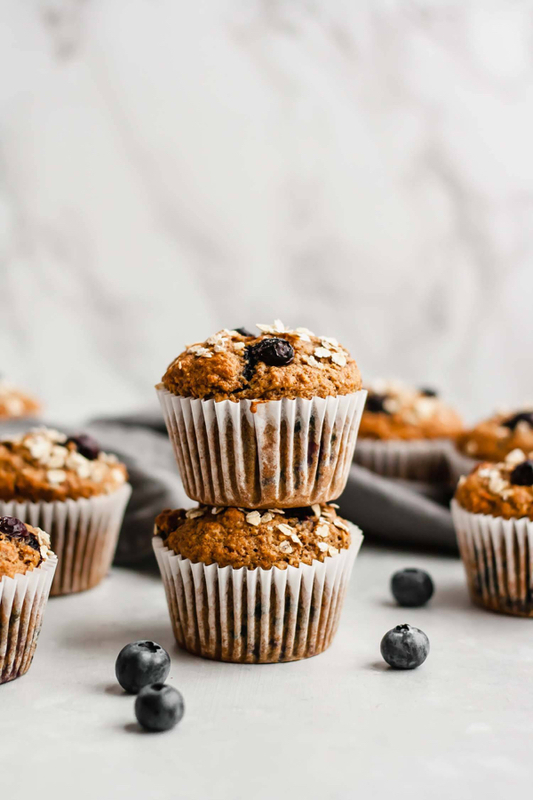 Oh, this is my kind of snack: wholesome, whole grain vegan blueberry muffins, made with spelt flour and rolled oats. 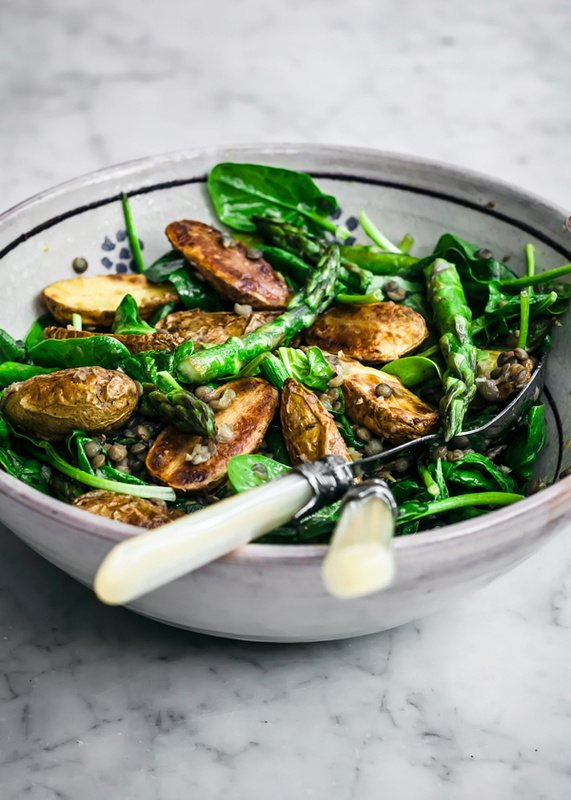 I’m loving my friend Alexandra’s mustardy new potato and asparagus salad (just look at the crispiness of those spuds!). 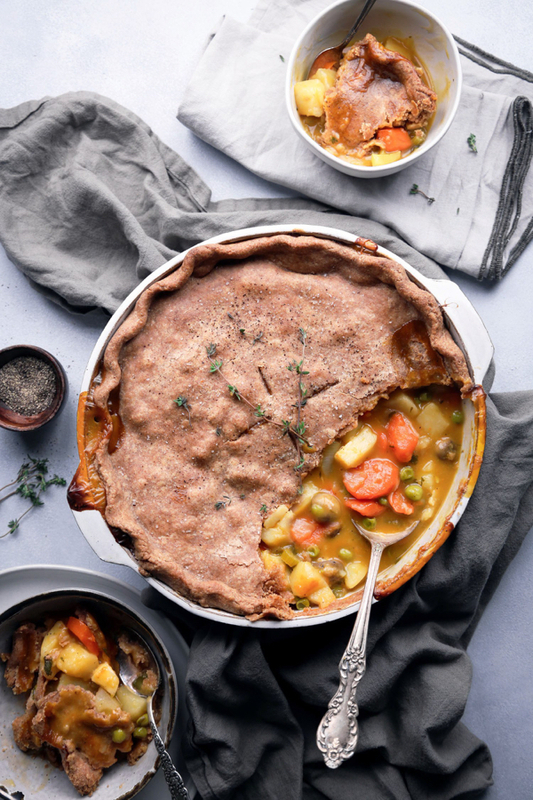 June isn’t exactly pot pie season in my part of the world, but Joscelyn’s vegetable pot pie looks so hearty and delicious that I just may need to try it soon. 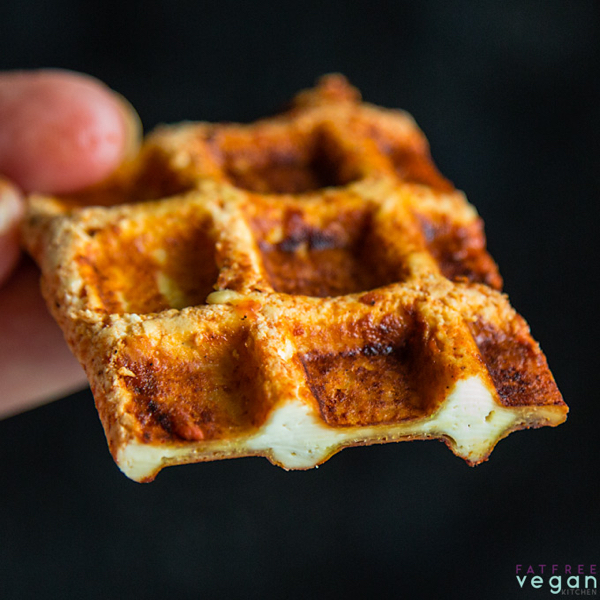 Clearly, I need to get on the BBQ waffle iron tofu bandwagon—a totally genius idea from Susan of FFVK. 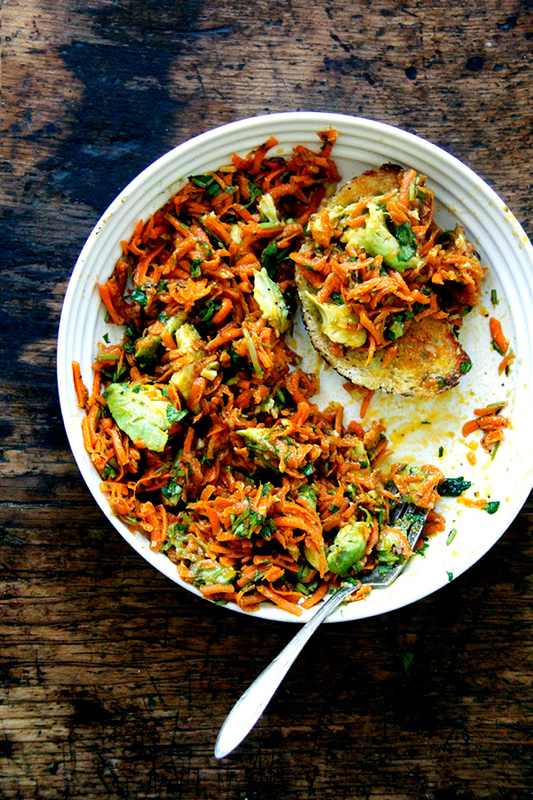 I spied Alexandra’s Moroccan carrot salad with harissa and avocado a few weeks ago, and I’ve been dying to make it ever since, and then to slather it on a piece of her wonderful bread. 1. I’m not sure how separate I think acedia is from depression and vice versa—at least for me—but I’d never even heard of the term until I read this article. The apathy and inertia Benjamin Sledge describes are certainly familiar components of my own experience of depression, and it was interesting to read about how commonplace they seem to be. 2. Outright potassium deficiency is incredibly dangerous, and I’ve never come across it in my work, but potassium insufficiency is a lot more common. Here are 6 telltale signs. 3. I’m always surprised at how little media attention and constructive advice is devoted to Binge Eating Disorder (BED), which is the most common type of ED in the United States by far. I like Christy Brissette’s tips for dealing with it, and I definitely echo her emphasis on regularly paced, nourishing mealtimes and snacks, as well as quitting restrictive and hypocaloric diets. 4. A new randomized trial with a large sample size suggests that lower fat eating patterns are associated with better breast cancer survival rates in women. In real world dietary terms, this would almost definitely mean placing a greater emphasis on plant foods. 5. A new health study examined the cost efficiency of plant-based diets as well as their appropriateness for overweight patients who were seeking to healthfully lose weight. As it turned out, plant-centric eating patterns were economical as well as effective for weight management. 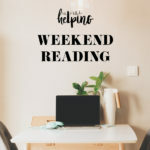 It’s great to see cost examined directly here, as fear of higher grocery bills is a big concern for many folks who are trying to eat lower on the food pyramid. One upside of having a cold is the creamy, tasty cauliflower turmeric soup I made yesterday, which I’ll be blogging about soon. But first, this week, I’m sharing the simple balsamic tahini dressing that I’ve been calling my “everything dressing” lately, for obvious reasons. Unfortunately i can relate to demanding too much of my body for too many years and suddenly being astonished to learn i just need….more. At the moment i am also fighting a nasty upper respiratory infection of some sort (which is thankfully rare) and it is so hard to care for myself the way i would a loved one. I hope you are feeling better! It’s hard on the spirit to get sick again and again. When I’m sick or injured, it can affect my self esteem over time, even though I know logically it’s not a personal failing to be sick. 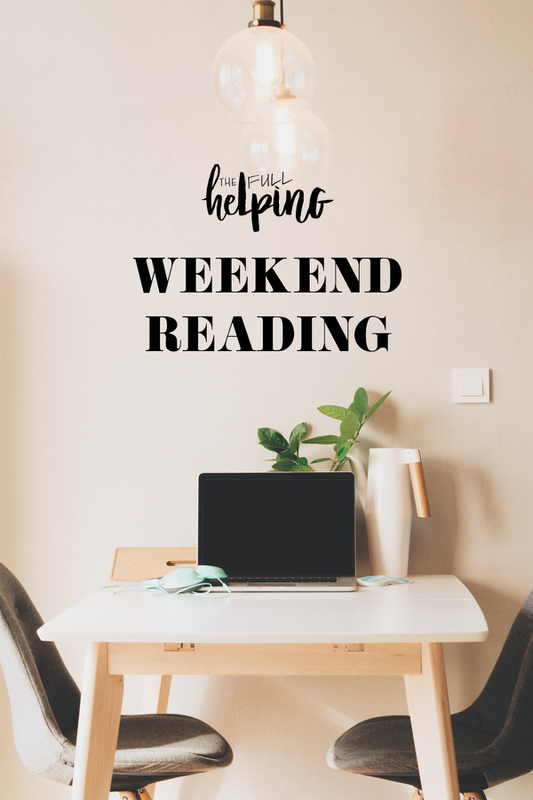 Like you said, we can be attached to our own self-identifiers, and when we have to slow down, take care of ourselves, and not tick off all of the boxes in a day, that can be challenging. I’m glad you’re giving your body the attention it deserves. Hugs to you.